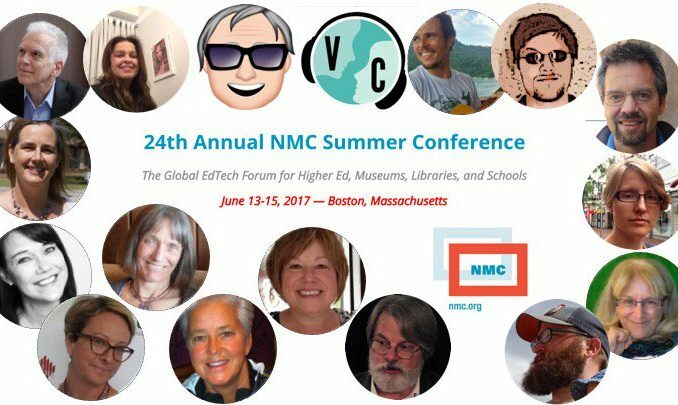 We are Virtually Connecting from Boston for the New Media Consortium’s (NMC) Summer Conference. The NMC Summer Conference (#NMC17) is a one-of-a-kind event, attracting highly skilled education professionals interested in the integration of emerging technologies and innovative approaches into teaching, learning, and creative inquiry. Onsite Buddies Greg Dillon and Apostolos Koutropoulos will be connecting us to those at the conference with help from Virtual Buddies Helen DeWaard, Ken Bauer, Terry Greene, and Autumm Caines helping out on the virtual end. On Wednesday, June 14th at 10:15 we’ll be joining onsite guests Maya Georgieva and Emory Craig to share conversation and insights about AR (augmented reality) and VR (virtual reality). On Wednesday, June 14th at 2:15 we’ll join with onsite buddies to talk to Michelle Pacansky-Brock and Jill Leafstedt. On Thursday, June 15th at 2:45 p.m. onsite guests Gardner Campbell and Christina Engelbart (Doug Engelbart Institute) will be joining onsite buddies Greg Dillon and Apostolos Koutropoulos. SIGN UP to participate in any of these session using this form OR send a direct message to Virtually Connecting on Twitter. Part of what makes VConnecting special is the spontaneity – onsite guests may have to join us a little later than scheduled or leave early. Onsite guests are usually only available for 20-30 mins, but virtual participants can keep going if they wish to.